To help you make an informed decision, we’re going to compare two of the leading services today – namely Bitdefender and McAfee. However, I want to be very clear about which products we’re reviewing. The problem with both of these providers is that they have a whole range of security products that are conditionally suited for different purposes. But today we will be comparing their ‘plain vanilla’ antivirus products, which were essentially developed to target, identify, mitigate, and eradicate viruses and malware from your computers and other devices. Some of the features in these products are packaged together with other more expensive subscription plans. 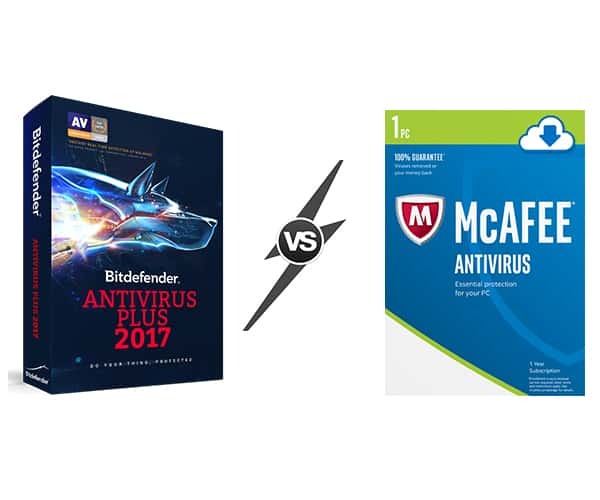 But if all you’re looking to buy is antivirus, then you’re looking for the Bitdefender Antivirus Plus 2018 and McAfee Antivirus Plus products. Bottom Line Up Front: To cut right to the chase, I generally much prefer Bitdefender here as it is the more affordable option. That said, if you have multiple devices (5+) the single bulk pricing of McAfee available here makes a lot of sense. Otherwise, the products are quite similar. First off, I’d like to point out that both Bitdefender and McAfee offer free trials and free versions of their service. If you opt for the free versions that can be used indefinitely, note that the antivirus software is stripped down, so you won’t have access to the full feature set. Still, it’s completely free, and I always say that an ounce of Internet security is infinitely better than none at all. I would advise you to at least considering the free versions, though the paid subscription plans have a lot more to offer and could mean the difference between worry-free computing and a complete meltdown. Antivirus is a bit like homeowners’ insurance for computers in that it gives you the peace of mind things are going go apocalyptic if you’re unlucky enough to experience a disaster. This may look a bit complicated, but just understand that they determine pricing based on the number of devices you wish to secure and the length of the subscription. Naturally, they discount longer subscriptions and plans with more devices. However, if you just want the smallest 1-year plan available, it will only cost $24.99 (For the latest prices and discounts, check here), which is much cheaper than McAfee. 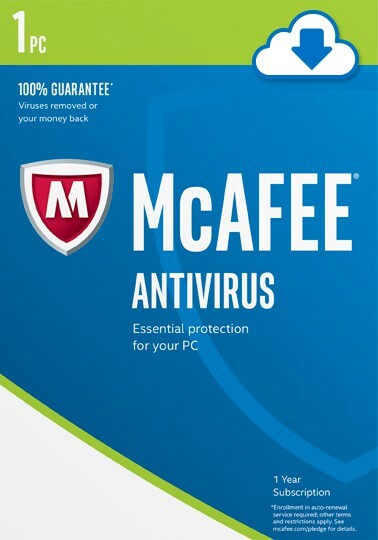 And that’s it – there’s no complicated pricing scheme with McAfee. And even though they cost more than Bitdefender, I think their cost is easily justifiable. In fact, I think they’re only slightly above the average cost for quality antivirus software, which seems to be around $40 or $50 dollars, depending on how many devices you want to secure. Next, let’s take a look at their features. In addition, the software comes with a file shredder that will permanently delete files in a way that makes them impossible to be recovered. This is a huge plus if you’re throwing away a hard drive, selling a computer, or just want to clean up old files. And naturally, it comes with a module that helps ensure safe payments and secure online transactions. And one additional feature they bundled in with the higher end plans that I really like is their password manager. However, it isn’t included in the Antivirus Plus subscription. It’s called True Key, and will help secure all your usernames and passwords in an encrypted database. Even if a hacker were able to their hands on the encrypted database file, they would never be able to open it without your master password (so make it long, memorize it, and don’t share it with anyone!). And that’s really all there is to their Antivirus Plus plan. It lacks additional features like parental controls, encryption software, email security and anti-spam, and other similar features. Nevertheless, the Antivirus Plus plan does still have the ability to scan and detect the latest forms of viruses and malware, and to delete them from your computer. 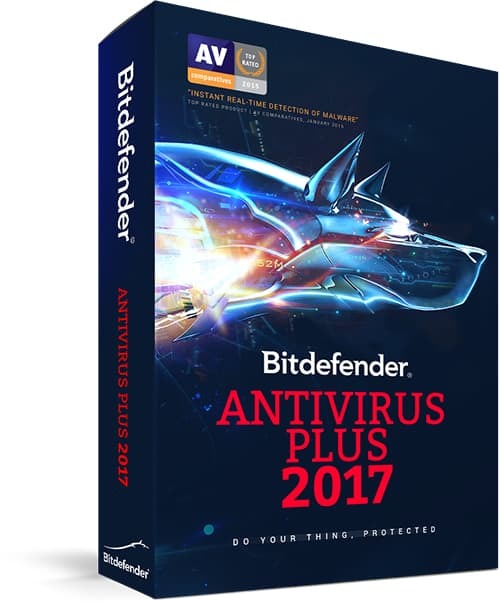 Bitdefender Antivirus Plus (full review here!) seems to be a bit more full-featured, which really surprised me since the 1-year subscription for 3 devices is half the cost of McAfee. It too has virus identification and removal as it’s core feature, but includes anti-phishing and anti-fraud features as well to prevent online attacks that would steal your payment information. And in addition to standard virus and malware removal, they also include a rescue mode and ransomware protection. For those of you who didn’t know, ransomware is a type of virus that makes your computer and files inaccessible unless you first send digital payment to an online account. And they also include a file shredder and a password manager, which isn’t included in the McAfee standard version. Furthermore, they include real-time protection to actively stop threats and kill malicious background processes before they can damage your system. Bitdefender also has an extremely small footprint, and won’t eat up system resources to the point that your computer becomes unusable. There are also three modes of operation, including game, movie, and work that optimizes system resources during a scan to help your computer run more smoothly. Last but not least, there’s even a battery feature that fine-tunes system configuration settings to maximize the life of your battery. All in all, Bitdefender is a lot more feature rich than McAfee. Final Thoughts: McAfee or Bitdefender? Though it’s a bit of a subjective decision as to which service is better, there are some things that can’t be denied. First of all, it can’t be denied that Bitdefender is cheaper than McAfee, especially with their 3-device and 1-year subscription special. In addition, they have a lot more features than McAfee. If you wanted the same features with a McAfee product, you’d have to opt for the more expensive plans such as Total Security or the Internet Security plan. And due to the increase in their prices, I have a little trouble justifying the value of their service. The only real advantage I can see with McAfee’s Antivirus Plus product is that it can be used on an unlimited number of devices. If you’re trying to secure a lot smartphones and computers at a small business, it would be more economical to opt for McAfee. Likewise, if you’re a tech junkie with a thousand and one different devices or you have a family with a lot of mobile devices, McAfee could be the better choice. But for me, I think that Bitdefender is the all-around superior choice. Both services have comparable customer service and great online documentation with usage and troubleshooting guides, FAQs, and a knowledge-base. So in a nutshell, Bitdefender is cheaper and packed with more features. But don’t misunderstand me – I do think McAfee is a great service. It’s just that your dollar stretches further with Bitdefender. Last but not least, I strongly urge everyone to at least take advantage of their free service if you don’t want full protection. At the very least, you need to have some protection against viruses. Bottom Line: Go with Bitdefender here for most users, especially 1-2 devices. That said, if you have multiple devices (5+) the single bulk pricing of McAfee available here makes a lot of sense. Otherwise, the products are quite similar. 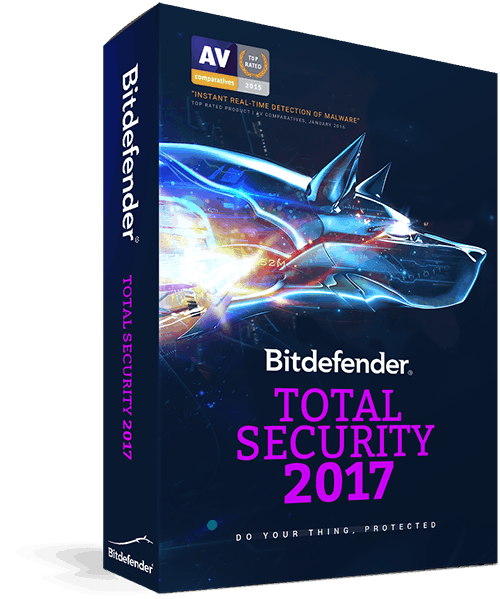 How does Bitdefender compare to other antiviruses?